This is pretty interesting, though I question its long-term usefulness. 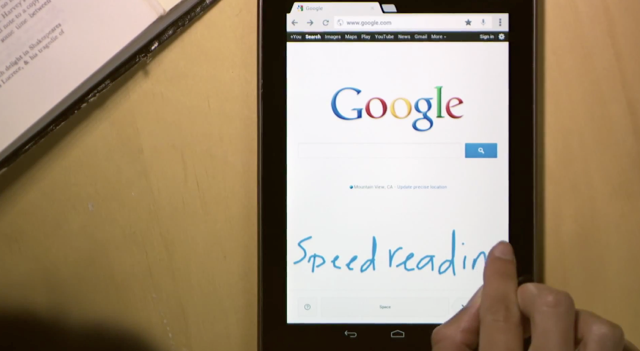 Google has launched a feature called Handwrite for Google search that allows you to actually enter your search term using a finger or stylus. While Google is right that it is sometimes inconvenient to open a virtual keyboard and type a search time using one hand, the typical sensitivity of a phone or tablet screen makes complex drawing arduous. But Google is not pushing this as some alternative to a note-taking app, but rather a way of entering search terms when on the go, or when your other hand is busy. To enable Handwrite, go into Settings on Google.com on either a Android 2.3.3+ phone, an iOS 5+ iPhone or iPad, or an Android 4.0+ tablet.